The Worksite Hawk: Innovative Management and Security! Innovation is what puts a tool at the forefront of management technology, and the Worksite Hawk has that in spades! The Worksite Hawk is the best, most cutting-edge piece of equipment on the market. 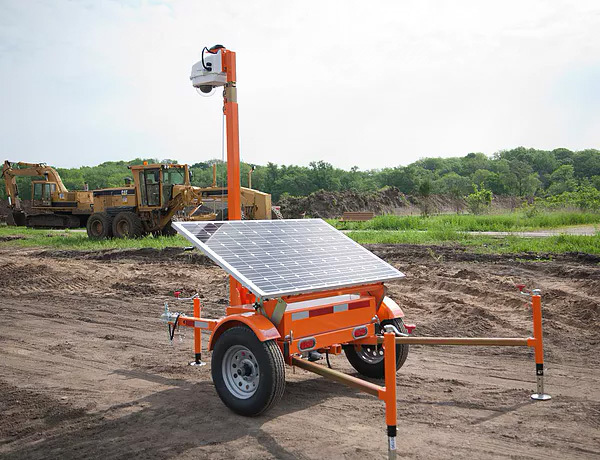 This solar-powered device features a PTZ camera that offers a clear view of the jobsite, as well as 200 days’ worth of storage for a comprehensive video record of what has occurred. At any time you can use your computer or mobile device to watch a live video feed or to review footage, keeping you connected to the jobsite at all times. One of the Worksite Hawk’s unique features is the internal wiring. This sees the electrical wires run internally up the mast, instead of coiling around the outside, where they are vulnerable to various kinds of damage and interference. With the wiring safely secured inside the steel mast, the unit is protected from bad weather, tampering, vandalism, or anything else that could otherwise threaten the integrity of the jobsite. Additionally, the Worksite Hawk is equipped with a GPS device that tracks the unit’s location, so you’ll be able to track it wherever it’s at! For a live demonstration of the Worksite Hawk’s capabilities, call us at 319-415-1226 or email us at sales@CrossroadsMfg.com.